When Laura Sparks moved into the office of the president, she added four framed pictures. On the bookshelves, she placed two photos of her family, including her husband, Dr. Andrew Sparks, her son, Casey, 12, and her daughter, Haoshun, 9. The other two pictures, given to her by Day Gleeson, a venerable associate professor in the School of Art, are 1860s-era Harper’s illustrations of The Cooper Union’s art studios of the time, including members of the women’s-only school. “They are a reminder of the vision of this place,” says the new president, who officially began her tenure on January 4 as The Cooper Union’s thirteenth president and the first woman in the position. During an hourlong conversation, Sparks expounded on what that vision means to her and what she sees as her own mission to continue that vision into the future. Sparks, 42, grew up outside Wilmington, Delaware. Her father, a family-practice physician from Philadelphia, and her mother, an immigrant from the Philippines and a former nurse, helped foster their daughter’s interest in helping others. She entered Wellesley College as a premed student, but a pair of freshman humanities courses changed the direction of her intellectual energies and her life. For the past 20 years she has moved among the corporate, nonprofit, legal and philanthropic sectors, seeking solutions to social and economic problems. 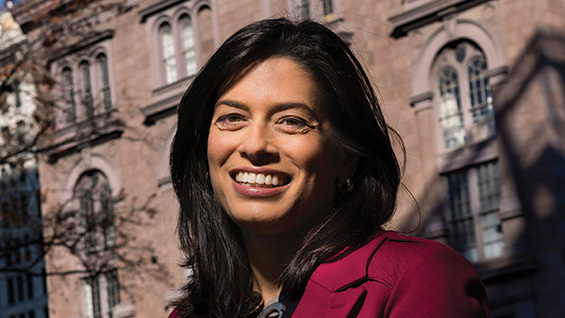 Within the last 10 years, she worked at Citigroup, headquartered in New York, where during the housing crisis of 2008 she led teams that gave voice to the needs of low-income and minority households that had fallen victim to the housing crash, to reconcile them with the needs of banking regulations and shareholders. Most recently she led the $2 billion William Penn Foundation, Philadelphia’s largest philanthropy, which had undergone a crisis in leadership and constituency confidence. Sound familiar? Can you identify a thread that has run through your career? Much of my work has been about trying to find multisector and multistakeholder solutions to complex social problems. My aspiration is for everybody to have access to resources and opportunity in order to get a fair shake in life, regardless of the circumstances they are born into. We live in an increasingly complex world, and there are very few problems that have a single lane to a solution. I have found that it is often the combination of the private sector, public sector and civic sector coming together that makes something happen. In the second semester of my first year at Wellesley, I took two electives, Introduction to Moral Philosophy and Introduction to Macroeconomics, at the same time. That completely changed the way I looked at the world. Philosophy offered a framework for talking about big issues—theories of justice, religion, metaphysics—and having reasoned debate about them that I found incredibly appealing. Macroeconomics opened my eyes to an entirely different way of looking at the world’s problems. As I started understanding economics, thinking about the connections in society among capital and investment and what’s going on in underserved communities, I realized that I could potentially help people in ways different from those I had originally envisioned through medicine. So that launched me on a journey of thinking through ideas of social and economic justice and how those ideas intersect with a capitalist construct: this notion that the free market is premised on having “winners” and “losers” but that we are also a part of a country built on the idea of equal opportunity. How do you reconcile those two things? That’s what I spent my college years thinking about. So what did you do right out of college? I thought I was going to end up working at a community-development organization, and I ended up working at Goldman Sachs. [She laughs.] As part of my undergraduate exploration of capital, investment and solving social problems, I spent time interning at Franklin Research and Development, now called Trillium Asset Management, the oldest socially responsible investment firm in the U.S. I also spent a summer working at a community bank on Chicago’s South Side. I found these experiences fascinating and rewarding, but it was clear that there was no defined career trajectory in that work without financial experience. So I submitted applications through the Wellesley recruitment office to various firms, including Goldman, where the telecom department was considered one of the most dynamic in the industry at the time. While I have some mixed feelings about Goldman and its role in our economy, as a training ground for developing financial skills it was phenomenal. But on a personal level, I was miserable and had little attachment to the work I was doing. It was my first realization that I really need to do something that I am passionate about. What drew you to getting a law degree? After Goldman I moved to a national nonprofit organization that supports the work of nonprofit community-development financial institutions that lend responsibly in underserved communities and provide capital for affordable housing, small businesses and other areas of need. I enjoyed this mission-focused work, but after a while I realized that more formal education might position me to have a greater impact. I wanted to further develop my financial and management skills, and I was also interested in policy and regulatory issues. The dual J.D. and M.B.A. offered an opportunity to get more financial expertise and understand the legal framework for policy issues. My husband and I had just moved to Philadelphia, so I applied to the University of Pennsylvania and was fortunate to be accepted. Those were busy days, as I pursued my J.D./M.B.A. while Andrew began work toward his Ph.D. in education policy, also from Penn. Your career seems to have taken quite a pivot in coming to The Cooper Union. In some ways yes and in other ways no. I’ve long thought that working in higher education is something I would like to do for a variety of reasons. My undergraduate experience was so powerful in my life. It completely changed my personal and professional trajectory, and it changed the ways in which I thought about the world. So I have always treasured that time in somebody’s life as being really influential and important. During my time at the University of Pennsylvania, I saw the important role an institution can play in its community. Penn is a large institution with tremendous resources that borders one of Philadelphia’s poorest neighborhoods. It was fascinating to see the positive impact that the institution could have on the community when its efforts were targeted effectively, as well as the negative impacts it could have—intended or unintended—when things weren’t so well considered. In addition, my husband’s work and research in the education sector have kept education issues front and center for us for over two decades. How did you come to apply to The Cooper Union? When I got the call from the recruiter for The Cooper Union, he explained to me everything that had been going on here. And candidly, I think I said, “I would have to be crazy to do that. Why would I do that?” The William Penn Foundation had gone through a series of leadership transitions. I had navigated that and helped get it to a very stable place where the organization was functioning well and the work was at an entirely new level. Our grant-making teams were doing great work and the foundation had, in many people’s view, established a much greater level of trust within the community. I felt that perhaps I should just stay and enjoy seeing our hard work bear fruit. As I learned more and more about Cooper, I got really excited. The progressive roots of this institution really appealed to me. Peter Cooper, pre–Civil War, was creating an institution that he wanted to be open to all races and genders. That just wasn’t happening at that time. He wanted education to be both practical, teaching very tangible skills to help better people’s lives and economic situations, and an experience that was intellectual and could help a student become an enlightened public citizen. The mission aligned with many aspects of my career and my life. Still, the current state of the place seems like a lot to take on. It may seem that way, but when I really started trying to understand what was going on, it boils down to a few things: financial challenges, which are significant; legal challenges, which are largely behind us; and cultural challenges, which we are working to overcome. I looked at my time at the William Penn Foundation and at Citi, trying to lead teams through financial and leadership crises, building culture, community and greater sense of purpose along the way. I reflected on my enthusiasm about what this institution represents historically and currently and what the possibilities are going forward. I knew it was an opportunity I couldn’t pass up. How do you imagine The Cooper Union continuing its legacy? I interviewed for this position during the election season, when our public discourse was unproductive and coarse. Regardless of one’s political perspective, I think we can all agree that we don’t seem to know how to have productive civic discourse anymore. And when I look at what this institution represents, I see a huge opportunity for The Cooper Union to be a leader on that front. We can lead by example, and that excited me. I also got excited about trying to figure out the challenge around full-tuition scholarships at Cooper and how that relates to higher education more broadly. Nationally, we have a system right now that is not sustainable. As we work to try to restore full-tuition scholarships at Cooper, I hope we can play our part in demonstrating the value of higher education that is both excellent and financially accessible, serving as a model institution and influencing policy debates on this issue. What steps did you start taking once you got the job? The first thing the Board and I did, with input from faculty and administration, was put together a transition plan that we shared with the community. I have been implementing that. I had more than 65 different meetings with Cooper stakeholders prior to my official start date. The idea behind those meetings was really just to listen. I had done a lot of research about the place, but it is very different to meet people and come to understand, genuinely, what this place is all about. That will continue. Since my official start, I have continued this process of listening and learning while working with the Board to map out a strategic planning process that will engage our community in defining a shared vision and path forward. I am eager to articulate this process with the Cooper community and to work collaboratively to develop and implement a compelling plan for Cooper’s next chapter. No, actually, my perception hasn’t changed. There is always the concern that you will get somewhere and not know what you signed up for, but there have not been a lot of surprises yet. I think that’s good. I credit the search committee in many ways for that. It was really straightforward and candid about the situation here and what would be required to get to a better place. I asked a lot of questions. I did a lot of digging. I read the audits inside and out. I read the 990s. I read all the press. The process was very good, because the last thing this institution needs is for somebody to get here and not be aware of what is going on. I’m not sure that it was a surprise, but it’s certainly been reassuring to see that we have a Board of Trustees that is fully committed and working hard to ensure a productive approach to governance. It’s clear to me that our stakeholders and constituents—from the Board to faculty to staff to students to alumni to funders and beyond—share a passion for and commitment to the school that I look forward to cultivating. What particular talents or skill sets do you see yourself bringing to the role as president? I put them into two buckets. The first is practical. I think I bring significant financial, legal and management experience. I have spent a lot of time designing and implementing new strategies to move organizations forward. A lot of those strategies, particularly in my last role, have built on important legacies of the past while taking the work to new heights. I often ask myself, “How do you stay true to and honor the past while moving forward?” So strategy, finance, legal—we need all of those things to design a vision that is aspirational but also grounded in reality. The other piece goes more toward culture. One of the things I try to bring to all of my roles is an understanding that there can be many ways to solve a problem, and I have worked hard to engage communities in working collectively toward solutions. So what are your weaknesses? I am not great at balancing work and the rest of life, in part because I’ve chosen a career that is so closely tied to my personal passions. I learned very early on that I could not be happy in a job that is unconnected to my passions and interests. I think that is true for many people at The Cooper Union. And because of that, work can sometimes be very consuming. As a woman and as a parent, I want to model that professional leadership and family can coexist, but I’m also not naïve enough to think that this is easy. It’s a daily juggle. The Free Education Committee Status Report came out in January. What’s your view of getting back to “free”? I will answer in two parts. I am 100 percent committed to returning the school to full-tuition scholarships in the larger context of also returning the school to sustainable financial health. I very much believe there is a path back to “free” and I would not be here if I didn’t. I presented to the Presidential Search Committee and to the Board that commitment, and my thoughts on why I think that is possible. It won’t be quick, it may not be soon, and it won’t be easy, but I think it’s important to do our best to fulfill this aspect of Peter Cooper’s vision. I fully expect that a year from now we will deliver a plan to the attorney general’s office for returning to a sustainable full-tuition scholarship model. We will figure out over the course of this year what the time frame for that is and which levers we can pull to get there. I said I would answer in two parts because I believe this school is about so much more than its scholarships, and I don't want us to lose sight of that. I led in this answer with “free,” because I know that’s what is at the forefront of many people’s minds, and I am personally committed to working toward that result. But “free” does not in and of itself equate to quality, and I don’t want our focus on “free” to obfuscate all the other things that this institution represents that are of value: academic excellence; rigorous and creative ways to teach students; being a leader in finding solutions across many fields; a unique and independent student culture; Cooper Union’s history as a space for civic debate and expression. All of these things are incredibly important to who we are and what we can contribute. Where do you see The Cooper Union in one year? One year out, I hope and expect that we will be operating in a very collaborative way and that we will be engaged in a process to implement an exciting plan for this school moving forward. I take a different view of planning than some people. I don’t believe it is as sequential as “You plan and then you do.” I believe that you plan, but in the process you are testing and learning things as you go to discover what works and what doesn’t. Early action is very important. It gives people a sense of what it is we are attempting to do. It creates energy and momentum to believe what is possible for the future. So year one is about both planning and early action. My view is that by the end of the first year, people outside The Cooper Union should be very focused on all of the positive things happening here, both past and future, and not so much on recent challenges. A year out, I expect that we will feel different as an institution—that we will be working together in a positive, collegial way, having emerged from a period defined by difficulty. How about five years from now? I expect that in five years we will reflect the founding principles of The Cooper Union even more strongly than today. That means we will have refreshed what we are doing in a way that brings those founding principles into this new chapter and has set a course for us to be financially sustainable and to be an institutional leader well into the 22nd century.